How’d you get your start in bike racing? I ran my first marathon at 18. I did another marathon at 19 and kept getting injured so I was going to spin class at the gym for cross training. A guy at my work invited me to go mountain biking. I went on two rides with him on my brother’s old bike and he said, “hey you should do a race.” I was like, “no, I don’t know anything about mountain biking.” He said, “that’s OK, you’re just scared.” I said, “no I’m not” and went to the race. It happened to be the New Mexico state championships and I saw that there was nobody in the Sport category–which is the intermediate category. So if I registered for Sport I would win the state championships. All I had to do was finish. I had no idea what I was doing. My bike didn’t shift. I had to walk probably half of it. I was the last person to finish the race. Every single person was already gone. It was just the race promoter waiting for me. After that I was hooked. I bought a real bike and started racing. I started training not too long after that and I pretty much quit running and it all went from there. What was your path from that point when you started taking it seriously to where you are today? I started cross-country racing and got my pro upgrade after maybe two years. I was driving up to Colorado all the time to race. I finished my undergrad degree and decided I was going to go to grad school in Boulder. I got a full ride fellowship to their PhD program in electrical engineering. When I got there I started racing on CU’s cycling team and we won nationals that year. I started getting integrated into the community in Boulder. From there, I was working as an engineer for a start-up solar company and also riding for Sobe-Cannondale that year. We were sponsored by Ergon. I wrote a review of the Ergon backpack on my website and it sent so much traffic to Ergon’s site that they contacted me and put me on their race team and gave me a job as their national sales and marketing manager. I started traveling all around the United States visiting bike shops and training people on our products and working events. I was able to travel more for my racing because I would tie it in to my work trips. I started racing endurance events because I got tired of riding bikes around in circles and I wanted more adventure in my life. Then I decided I wanted to start doing multi-day races. The Breck Epic came along just as mountain bike stage races started popping up. I did Breck Epic in maybe 2010 and raced it as a co-ed with a teammate. We won the race. Then my teammate and I were invited to go to Brazil for their first stage race, Brasil Ride. 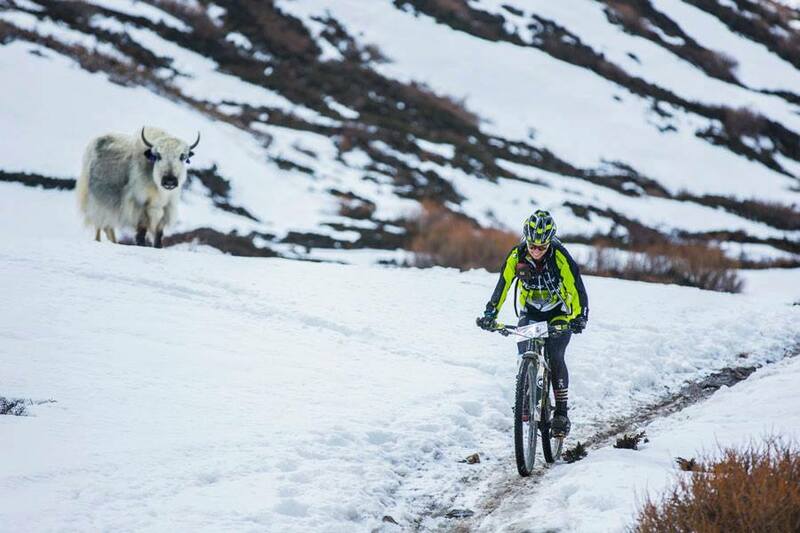 Then I raced a stage race in Nepal called the Yak Attack. It’s a 10 day race across the Annapurna circuit. You have to carry your bike over 18,000 feet in the snow. It was really intense and really amazing. That experience changed my entire career. I said I want to do more of this. This is what I want to do with my career and my life. When I travel to far off places and put myself through these challenges and meet other people it makes me experience life in a different way. It makes me a better person. It makes me more confident. It gives me better perspective about the world and who I want to be. Since then I’ve been doing everything I possibly can to do all the hardest stage races I can find. I’ve returned to the Breck Epic as a solo rider. I’ve also returned to Brasil Ride and the Yak Attack as well. That pretty much brings me up to today. 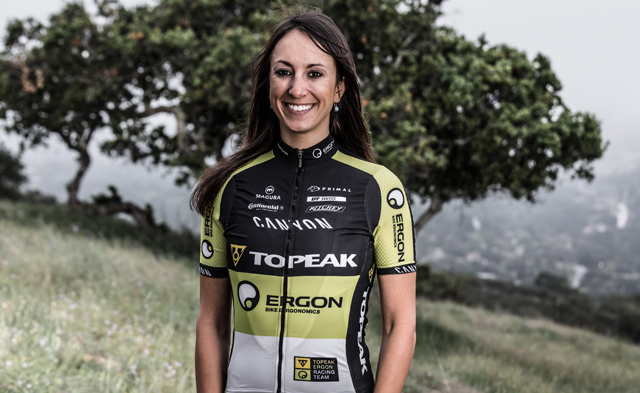 I just recently quit my job with Ergon and also quit the Topeak Ergon race team. I wanted to work with sponsors on an individual basis. Topeak Ergon and Ergon were great. They helped me become who I am today, but I’ve outgrown my position there. For next year, I got to handpick all the sponsors I’m working with. I get to only promote products that I 100 percent believe in and I get to spend more time developing content for each one of them. Sometimes there literally are yaks at the Yak Attack race. Photo via Yak Attack Facebook page. You already hit on this a bit, but why do you find endurance so appealing? I love endurance racing because it’s an adventure. It’s also the best way to see a country or a new area. You cover such a huge distance, especially with the ultra-endurance stage races, and you really get to see the guts of an area that you wouldn’t see on your own or wouldn’t see in a car. I love it because I get to really experience the place I’m in. I get to live like locals. At the Mongolia Bike Challenge you sleep in Yurts. In Nepal you sleep in tea houses. Other races you’re in tents in the middle of nowhere and it’s a unique experience. Looking to the future, my goal is to do all the hardest stage races in the world and I have some cool ones on my schedule for next year. But there’s going to come a point when I’ve done all of them and done them multiple times. After that I can see myself creating just adventure rides for myself to go do that have no race around them at all. All bike racing involves pain to some degree or another, but endurance racing prolongs that pain and suffering for many hours on end. Do you find some satisfaction in the suffering? I suffer a little bit in stage races. There’s a level of pain, for sure. I think about pain in cross-country racing, because pain is a lot more intense, you have to ride a lot harder in a cross-country race. But in an endurance race–if you want to talk geeky bike-science talk–you ride below your lactic threshold in a stage race or endurance race. In a cross-country race you’re pushing at or possibly above your lactic threshold as much as you possibly can so it’s a lot more painful. When I’m doing these long races it feels like I’m just out for a ride. A hard-paced ride, but not a crazy, I’m-in-the-red ride. It’s actually really enjoyable for me because I like to ride at that pace and it’s not super painful. A lot of it is about your attitude. I have fun. If I see a crazy climb that’s going to hurt, I think it’s funny. It’s going to be hard and for whatever reason it makes me laugh. I think it’s really important to keep that perspective in life and on the bike. You have to have a sense of humor about everything. I just did this race in Sri Lanka. They’re making a movie on it and the videographer pulled me aside one day and said, “can we ask you a favor? We need you to look more intense when you’re racing, like you’re suffering and it’s hard. You’re always smiling. Can you not smile?” I said, I don’t know if I can because that’s how I race. I am having fun and I don’t take myself so seriously that mentally I’m having problems. I just really enjoy what I’m doing. There are times when it hurts really bad and I’m suffering and it’s long and I want it to be over. Of course that happens. But you just have to accept it and make the best of it. Probably on some subconscious level I really enjoy overcoming that. It’s gotten to the point that I’ve overcome it so much that I’m just able to do it naturally. You mentioned starting your own marketing business and doing marketing work for Ergon previously. Is it necessary to have a side job of some kind or is it possible to make enough money just off of endurance racing? I would say 90 percent of people cannot make a living off racing. I’ll disclose that Topeak Ergon did not pay me to ride my bike. They gave me equipment to ride, which was really, really helpful and the flexibility with my job so I could train and take off the time. But my salary was for sales and marketing. I think most people do have to have a job. Next year I’m working with all my sponsors and I’m delivering a lot to them. I’m helping them sell products, but in a way that is genuine. I chose to work with them because I believe they have the best products and I want people to know about them. Next year I could have the option to just ride my bike. But I’m choosing not to do that because I really enjoy marketing strategy and working with start ups and building business. I need to use that part of my brain. I’m keeping that part of my business small, but whenever I quit racing I plan to transition into working and providing this marketing strategy insight mostly with start ups in the future. I also have my own clinic series called ON Dirt. I’ve done some rides with it and skills clinics, but most of the time it’s a Q&A session where I can help people who are trying to learn about the sport of cycling. They can ask me anything and I tie in some of my adventures and what I’ve learned from them. 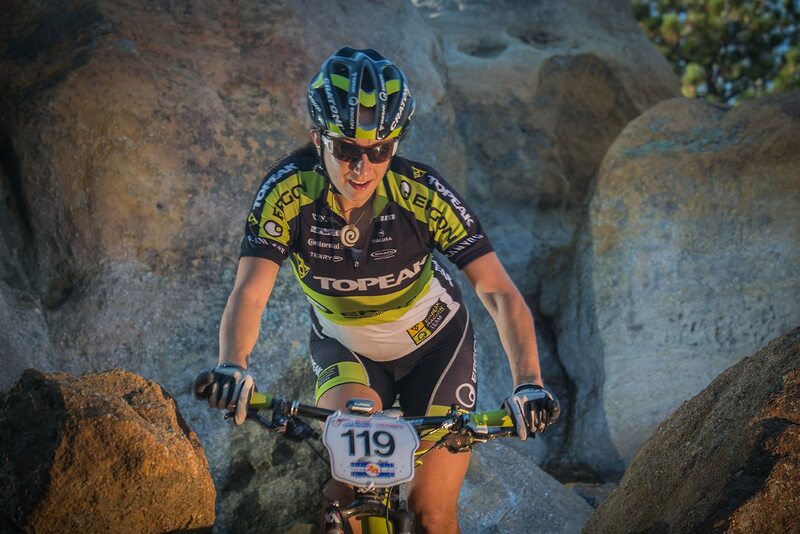 Sonya Looney racing the 24 Hour national championships. Photo via Ergon Bike. That’s awesome. I mean, it’s not awesome that can’t just make a career out of racing, but good that you’ve got your business lined up. People think that pro racers are making money. There’s a minimum wage that pro tour road cyclists make, but that’s pretty much it in terms of male or female, mountain biking or road cycling. For me, when I say I could make a living just on my sponsorship money for next year, the sponsorship money isn’t for me to train to get fast and go to races. That’s not what they’re providing money for. They’re providing money so I can produce content for them and bring them a return on their investment. People don’t know this, but most sponsors don’t care about your results so long as you’re credible and you’re a good person in the community who’s able to connect with people. The goal is to get people to buy bikes. If I just took my sponsorship money and trained and got faster and only did that, I would lose all of my sponsorship. I can guarantee that. Being a pro racer is a full time job because for me, I have to manage a marketing business for my sponsors and I have to manage my training. Those two go hand in hand. I think people think, “oh, you’re a pro, you just ride your bike, that’s all you do.” And in some cases that is all people do. But the way I’ve structured myself and the way I’ve structured my sponsorships is long term and viable and not just results based. I think it’s a great way to manage yourself as a pro athlete. Mountain biking has taken you all of the world. Has there been a particular race or place you visited that’s been your favorite adventure? The Yak Attack in Nepal that went across the Annapurnas. Nepal is the most unique country I’ve ever visited. The people there had a good energy about them. It was beautiful. And it was somewhat untainted by the western world. You don’t just go into Katmandu and see a Starbucks on every corner. In Katmandu there is no traffic light, no paved road. It’s just mass chaos on the road with bikes, scooters, trucks, cows, anything you can imagine. No street signs of any kind, no stop signs, nothing. It’s a very genuine place. It is what it is. I know it probably is tainted by other influences. But to me it just seems like a really genuine place with really incredible mountains. It was a place where I felt really peaceful. You already mentioned plans to do every major mountain bike stage race in the world and start your own marketing business, how much longer do you think you’ll be racing as a pro? While it’s still fun? While you’re still succeeding? I’m going to keep doing it while I feel like I’m growing and I’m not bored. If I become stagnant or too complacent I get bored. I’m always looking for opportunity and room for growth. I can see myself doing bike racing for ten more years, I can see myself doing it for three more years, it really just depends. I really love it and I see myself doing it for as long as I can. Cycling has a taught me so much and I couldn’t have learned this any way other than exactly what I’m doing. We are so much more capable than we give ourselves credit for. If you’re brave enough to take opportunities that come your way and keep an open mind and work hard then you’ll be successful in your life. You’ll be rewarded for it. You’re going to find out things about yourself that you wouldn’t have learned otherwise. It gives life a lot more substance. This entry was posted in Interviews, Mountain Biking, Racing and tagged badass women cyclists, breck epic, endurance mountain biking, mongolia bike challenge, mountain bike stage racing, nepal race, sonya looney, topeak ergon, yak attack. Bookmark the permalink. Sonya, you may want to try the Tour of the Dragon, a 260 km 1-day mountain bike race from Central Bhutan to the capital Thimphu. And there appear to be plans for a week long race across the whole country.